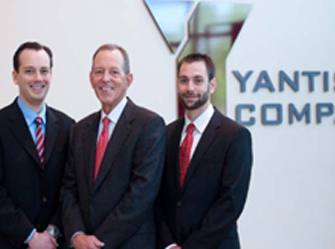 Mike Yantis, Matthew Yantis, and Mike Yantis Jr. announced a completed buyout of Yantis Company giving them 100 percent ownership of the family held company. With the completion of the transaction, on November 12, 2012, the company has announced several management changes naming Mike Yantis as Chairman; Mike Yantis, Jr. as Chief Executive Officer; Matthew Yantis as President; and Paul Basaldua as Vice President of Operations. Arnold Briones, Steve Deering and Paul Sparks remain in their respective positions as Executive Vice President, Vice President of Estimating, and Chief Financial Officer.